PEK Solutions WT AVL is the best hard wired Fleet Tracker on the market today. With lower cost and superior performance the WT AVL Fleet Tracking GPS solution will save you thousands of dollars now and for years to come. •	Increased Productivity/Reduction in Fuel Costs — Find closest vehicle to respond to a service call, and route fleets more efficiently by monitoring routes and evaluating historical data. •	Compliance with Programmed Routes — Ensure drivers do not deviate from authorized route; view entire movement history. •	Better Customer Service/Customer Retention — Faster response to service requests and accurate, reliable delivery status at any given time leads to more satisfied customers. •	Driver Accountability — Verify that drivers met expected appointments or service calls. •	Reduction in Unauthorized Vehicle Use — Monitor personal use of take-home vehicles; Eliminate moonlighting activities. •	Decrease in Speed/Increase in Personnel Safety — Reward good drivers for compliance with company policies and traffic laws by knowing how fast a vehicle is being driven and for how long it travelled at a predefined speed. •	Lower Insurance Rates — accurately document where all vehicles are at all times; Reject frivolous property damage claims. •	Complete Historical Record of Fleet Activities — View, print, or save reports at any time. •	Accurate within 5 inches of target. A completely wireless GSM video camera capable of transmitting around the world. This portable device uses the GSM cellular network to video via the Internet. Protect your home or business with our durable and reliable GSM security camera. This 300 pixel CMOS camera allows secure and convenient covert monitoring of your assets while you are away with on demand viewing via email or MMS messages sent to your cell phone. Connect other security devices such as smoke detectors and door alarms for a complete security system you can easily monitor 24 hours a day. 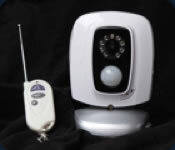 In the event of an alarm, our GSM camera will immediately send an alert and/or snapshot so you can quickly take the appropriate action to protect your property, reducing the risk of theft or damage from fire. With the camera's infrared capabilities, you'll receive clear images even in the dark. Easy off-site control means you can take advantage of this camera's many features without leaving the comforts of home or while you're on the go. Simply send SMS commands via your cell phone for complete remote access or to request images. Remote audio capabilities allow you to listen in on demand. •	External Connections: Connect up to 15 sensors such as smoke detectors, door alarms, etc. 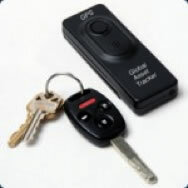 Quad mode GPS tracker works worldwide, 2 weeks continuous GPS tracking with emergency voice response. 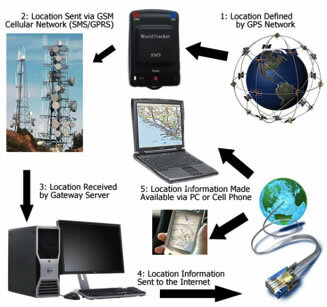 PEK Solutions PLD is the most complete and affordable covert personal GPS tracking device available today. PEK Solutions PLD provides tracking, reporting and monitoring for up to 2 weeks, capable of updates every 5 seconds works worldwide with both GPRS/SMS. PEK Solutions PLD's quad-mode allows the device to operate from any location in the world. The PLD tracker is equipped with GPS assist and works inside buildings and parking garages. One-way emergency listening and two-way voice options makes the World Tracker PLD is an effective personal safety device. Accurate within 10 feet of target. This new handheld GPS tracker lasts up to 2 years in stand-by mode with no monthly recurring fees. Activate and locate only when your asset is missing or stolen. Quad mode means this device and our software work worldwide. Accurate within 5 inches of target. Ideal for Law Enforcement, Corrections, Senior Citizen Healthcare & More! World's Smallest, Most Secure Ankle Tracker! 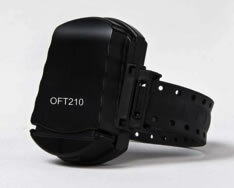 PEK Solutions recently released the OFT-210 —a technologically-advanced ankle bracelet GPS tracker specifically-designed with parolee and probation tracking in mind. Through fiber optic technology, a hidden backup battery system, and durable design, the Offender Tracker offers superior reliability and security to any ankle bracelet on the market today. The PEK Solutions is affordable and secure. 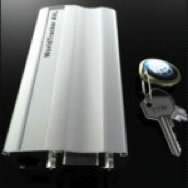 While other systems in the same price range may be vulnerable to thieves who often cut battery cables to disable a vehicle's alarm system and do well to notice cameras, the PEK Solutions comes equipped with its own back-up battery system and covert cameras that will protect your assets even if you are out of the country or battery has been disabled. Here are more security features of these versatile solutions. GPS Fleet Tracking Powered by PEK Solutions. Fleet tracking is perfect for any type of business that puts a lot of assets out on the road or sea. Current businesses using our products include emergency service providers, taxi cab companies, shipping companies and food and beverage distributors. Contact PEK Solutions to hear more about the products and services we can offer you and your customers. •	Increased Productivity/Reduction in Fuel Costs -- Find closest vehicle to respond to a service call, and route fleets more efficiently by monitoring routes and evaluating historical data. •	Compliance with Programmed Routes -- Ensure drivers do not deviate from authorized route; view entire movement history. •	Better Customer Service/Customer Retention -- Faster response to service requests and accurate, reliable delivery status at any given time leads to more satisfied customers. •	Driver Accountability -- Verify that drivers met expected appointments or service calls. •	Reduction in Unauthorized Vehicle Use -- Monitor personal use of take-home vehicles; Eliminate moonlighting activities. •	Decrease in Speed/Increase in Personnel Safety -- Reward good drivers for compliance with company policies and traffic laws by knowing how fast a vehicle is being driven and for how long it travelled at a predefined speed. •	Lower Insurance Rates -- Accurately document where all vehicles are at all times; Reject frivolous property damage claims. •	Complete Historical Record of Fleet Activities -- View, print, or save reports at any time.